Trichotillomania - body, causes, What Is Trichotillomania?, What Causes Trichotillomania? Trichotillomania (trik-o-til-o-MAY-nee-a) is a condition that involves compulsive (kom-PUL-siv) hair pulling, usually the hair on the scalp or the eyebrows or eyelashes. Penny put on her favorite baseball cap and headed out the door for school. The cap hid the bald spot on the side of her head pretty well. She envied the girls who could wear barrettes and ponytails to school, and she remembered the days when she had worn them too. Over the past 2 years, Penny had started to pull out her hair and her eyebrows. It began gradually at first, but pretty soon her eyebrows were gone, and she had bald patches on her head. She did not want to pull the hair, but she felt a powerful urge to do it. She just could not stop. No one understood why she was doing it, not even Penny. The boys in her class teased her. She pretended not to listen to them, but their unkind comments made her cry when she was alone. Even the nice kids asked her why she did not have any eyebrows. Until lately, Penny did not really know what to say. Then Penny began to see a therapist, who helped her understand that she had trichotillomania. Trichotillomania is a condition that involves strong urges to pull hair. People with this condition pluck or pull the hair on their heads, their eyelashes, their eyebrows, or hair on other body parts. For people with trichotillomania, the hair pulling is more than a habit. It is a compulsive behavior, which the person finds very hard to stop. A person with trichotillomania feels a strong urge to pull hair, an impulse that is so powerful that it seems impossible to resist. Pulling the hair often provides a brief feeling of relief, like the feeling of finally scratching an itch but much more intense. But after the feeling of relief, which lasts only a moment, the person usually feels distressed and unhappy about having pulled the hair. Soon the urge to pull hair returns. People with trichotillomania wish they could stop, and may feel ashamed or embarrassed. Many people who have this condition try to keep it secret. The condition trichotillomania was first described in 1889 by the French physician Francois Hallopeau. The term "trichotillomania" comes from the Greek words "thrix," meaning "hair," and "tillein," meaning "to pull." "Mania," the Greek word for "madness" or "frenzy," was used in those days for any condition that affected human behavior. Dr. Hallopeau wrote that his patients with hair-pulling compulsions were, in fact, quite emotionally healthy. * neurotransmitters (NUR-o-tranz-mit-ters) are brain chemicals that enable brain cells to communicate with one another and therefore allow the brain to function normally. About 75 percent of people with trichotillomania pull hair from the scalp. In many cases trichotillomania is a response to stress at home or school, while in others it results from a hair-pulling habit developed during childhood. function in the brain. Trichotillomania has some similarities to obsessive-compulsive disorder (OCD), but in trichotillomania there are no obsessions * , and hair pulling is the only compulsion. Both trichotillomania and OCD fall into the larger category of anxiety disorders. Some people with trichotillomania have other forms of anxiety as well. Trichotillomania can affect children, adolescents, and adults. 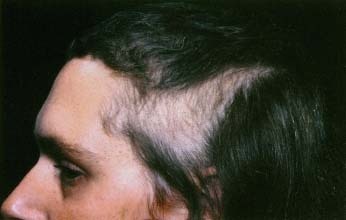 Both males and females can have trichotillomania, but it seems to be more common among females. When individuals lose their hair or eyebrows, doctors may first check for other conditions that might cause a person's hair to fall out, like ringworm, * alopecia areata, * or other skin diseases. But if the person tells the doctor about the hair pulling, it is probably trichotillomania. Penny's doctor sent her to see a therapist, a mental health specialist who listens to people talk about their experiences and feelings and who can help people work out ways to deal with behavior problems. The therapist explained Penny's condition to her and told her about the urges, habits, and anxiety that are part of it. She helped Penny understand that the hair pulling was not her fault. Penny felt relieved to know that she was not the only person with this problem and that there were things she could do about it. One common treatment for trichotillomania is a behavior therapy * technique called habit reversal. In habit reversal, the person first learns to notice the urge before the compulsion to pull hair becomes too strong to resist. Then the person learns to do something else instead of hair pulling until the urge grows weaker and passes. This can be more difficult than it sounds, because the person may feel increasing, uncomfortable tension and anxiety while trying to resist the urge to pull hair. With time and practice, the brain can begin to react differently to the urges, and the person can start to control the compulsive behavior. Some people also may take medication that helps with the compulsions and decreases the strength of the urges, making them easier to resist. After a few weeks of practice, coaching from her therapist, and support from her parents, Penny began to get better at resisting the urges she felt. Penny has started to see results. Her hair has begun to grow back in. * obsessions (ob-SESH-unz) are repeated disturbing thoughts or urges that a person cannot Ignore and that will not go away. * ringworm is a fungal infection of the skin or scalp that appears as a round, red rash. * alopecia areata (al-o-PEA-shah a-ree-AH-ta) is a condition that leads to sudden hair loss, often in small, round patches on the scalp. The cause is not known. * behavior therapy is a type of counseling that works to help people change their actions. What Is It Like to Live with Trichotillomania? Now that Penny's hair and eyelashes are growing in, she feels better about herself and more hopeful about coping with trichotillomania. Now and then, Penny may continue to feel urges to pull her hair and eyebrows, but she knows what to do to resist them. She knows that these impulses can be stronger in times of stress, but they also can arise on their own during times when Penny is bored or just relaxed. Her therapist is helping Penny learn and practice ways to cope with normal stresses, to stop the urges before they get too strong, and to control her compulsive pulling. Golomb, Ruth Goldfinger, and Sherrie Mansfield Vavrichek. The Hair Pulling "Habit" and You: How to Solve the Trichotillomania Puzzle. Silver Spring, MD: Writers' Cooperative of Greater Washington, 2000. A workbook and guide for kids and teens, parents and therapists that presents useful strategies and tools for conquering trichotillomania. Trichotillomania Learning Center, 1215 Mission Street, Suite 2, Santa, Cruz, CA 95060. The purpose of this organization is to advance the understanding of trichotillomania. I began pulling my eye lashes and brows at th age of about 8...Then my hair at about 10 I was terribly ashamed of myself.. I had a very controling father who physically and emotionally abused me..could this have brought on trichollimania? I would like to know how to help my niece with this condition?